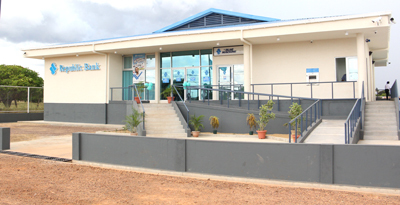 Lethem is now home to two commercial banks with the introduction of a Republic Bank branch. This private sector initiative is an indication that Region Nine is the most prosperous hinterland Region, even with gold mining activities in others. This is according to Ganga Persaud, Local Government and Regional Development Minister, who emphasized that the bank is a product of the economic hub that has been developing in Lethem. The bank was commissioned on Saturday and would be open for business today. He said a number of things are happening in the Rupununi, highlighting the cross border trade between Guyanese and Brazilians; movement of people across borders; collaboration of governments; and value added products being made in the district. According to the Minister, Rupununi residents are moving their development with diversifying their economic activities, particularly with the management of land space. He said savannahs which were once used for primarily ranching are now converted to farm lands. He said that Republic Bank is a regional leader in financial services across the Caribbean, and since its entry in Guyana, it has contributed in a very significant way to raising the standards in the country’s financial services sector, introducing new products, improving quality of service and improving access to services across the 10 administrative regions. He explained that the fact that the bank has been expanding in the manner in which it has in Guyana, speaks volumes of its confidence in the country’s economic future. Construction of the $185M edifice commenced in November 2012, and it will be opened for business from October 21 with a staff complement of eight highly-skilled professionals. Republic Bank’s Managing Director, John Alves said that the decision to extend their services to the Region Nine community was guided by their strategic plan for continued expansion. Meanwhile, Chairman of the Bank’s Board of Directors, Nigel Baptiste spoke of the promise fulfilled and vision realised. He said that the opening of the Lethem Branch is a clear demonstration of the bank’s continuing commitment as a partner in the economic and financial development of all corners of Guyana. “Our vision for expansion is strongly aligned with the trends shaping the local, regional and global economies. Among local developments are increased opportunities for home ownership and expanding small and medium businesses…” Baptiste pointed out.